ThermoFun’s philosophy is simple, delicious, flavoursome recipes, so you know when ‘Mad Monday’ rolls around that’s what you’re going to get. 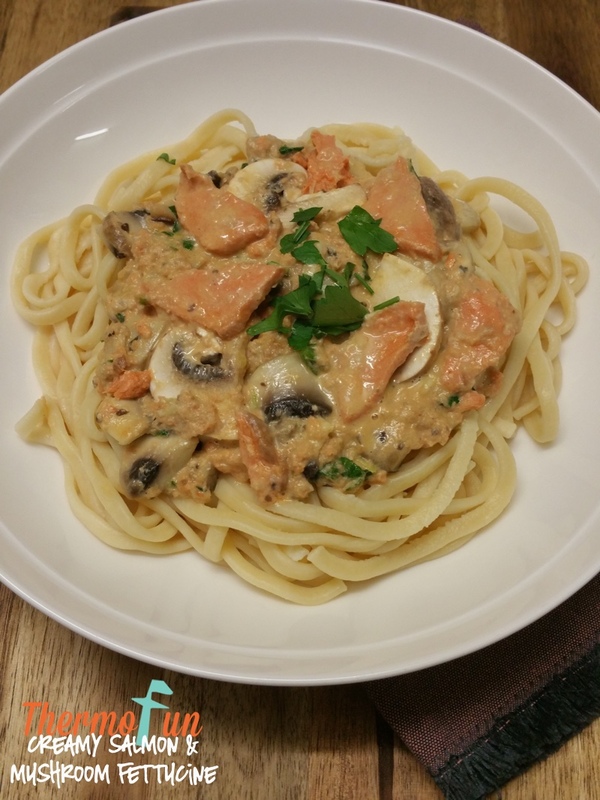 This thermomix Creamy Salmon & Mushroom fettuccine is the simplest and yummiest dish I have had lately! This recipe works so perfectly because yesterday was Mad Monday! That’s how hectic my Monday was that I didn’t even get a chance to post this! I trust your family will enjoy it as much as mine do. If you don’t like salmon or don’t have any – try tuna, or even some cooked shredded chicken works nice as well. Cook fettuccine in TM bowl as per EDC/BCB instructions and set aside into pre-warmed ThermoServer. Place garlic and spring onions into TM bowl and chop 3 sec / speed 8. Scrape down. Add oil and mushrooms and sauté 5 mins / Varoma / speed 1 / Reverse / MC off. Add cheese, salmon, cream, egg, pepper and parsley (reserving some for garnish) and cook 3 mins / Varoma / speed 1 / Reverse. Add salmon mixture to fettuccine and combine well. This recipe also works well with tuna or cooked shredded chicken. Yum! I had a packet of Smoked Salmon that needed using and substituted with it and even the kids ate it (admittedly the four year old just ate the pasta but he didn’t scrape the filling off). And your tip cooking the pasta (made it with penne) in the thermo server sheer genius! I made this also with smoked salmon. Turns out my cream was out of date so I substituted it with a tub of light philly spreadable cheese and one avocado. Hi, can you do with fresh Salmon as well? Hi Nick, yes I’d suggest you steam the salmon in the varoma for approx. 10 mins (time varies depending on thickness of salmon). After cooking in the varoma you can then cut it to the size of pieces you would like. Or you can cook it in the bowl but it would also need approx. 10 mins. We really enjoyed this. I baked some fresh salmon in the oven and served it on top of the pasta. Absolutely delicious and simple. This is an amazing recipe.